Broadmindedness, when it means indifference to right and wrong, eventually ends in a hatred of what is right. Whenever man attempts to do what he knows to be the Master's will, a power will be given him equal to the duty. Love burdens itself with the wants and woes and losses and even the wrongs of others. Head knowledge is worthless, unless accompanied by submission of the will and right action. Sheen's final presenting role was on the syndicated The Fulton Sheen Program (1961–1968) with a format very similar to that of the earlier Life is Worth Living show. The operation started in the St. This ceremonial position allowed Sheen to continue his extensive writing. [clarification needed] Starting in 2009 his shows were being re-broadcast on the EWTN and the Trinity Broadcasting Network's Church Channel cable networks. He held this position until 1966 when he was made the Bishop of Rochester from October 21 1966 to October 6 1969 when he resigned and was made the Archbishop of the Titular See of Newport Wales. 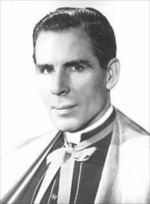 For 20 years he hosted the night-time radio program The Catholic Hour (1930–1950) before moving to television and presenting Life Is Worth Living (1951–1957).